I love my LYS. Not only do they not blink an eye when I say I am buying yarn to crochet somethting, but they also have crochet classes, crochet books and patterns, and a crocheted bag on display. And–drumroll, please–when I stopped in yesterday, they had the new, special issue, Interweave Knits Crochet. It’s a fantastic issue with tons of patterns–eight sweaters, tops, and jackets; four bags; three hats (one of which has three versions); men’s vest in tunisian crochet (with a tunisian crochet primer); dress; skirt; capelet; shawl; child’s cardigan; child’s bikini; beaded ballet slippers; pillow; two granny squares; washcloth; and baby booties. You can see photos of several of the patterns here. There’s also a handful of articles that look to be interesting reads. The yarn above is Adriafil Touch, color 31. 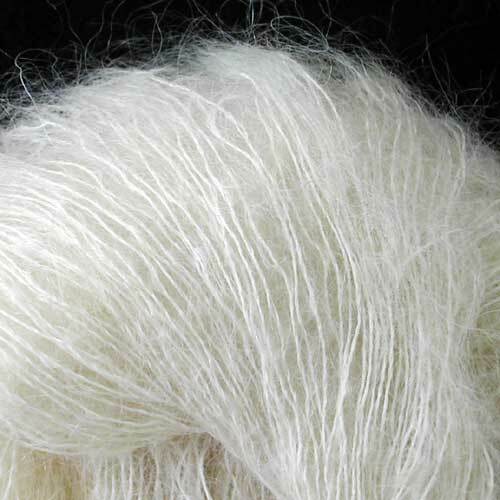 It’s 65% super kid mohair, 30% polyamide, and 5% wool. It’s gorgeous and soft and gossamer and I am in love with it. Did I mention it’s soft? Not at all scratchy like mohair often can be. Oh, and it’s also discontinued, which made me want to buy every ball they have at my LYS. But I didn’t. I only bought enough for the hairpin lace shawl in the November 2002 issue of Crochet! I still need to get merino wool, lace-weight silk, and seed beads. I loved the pattern as soon as I saw it–when I won six issues of Crochet! on eBay several months ago–but hadn’t mustered the motivation to get going on it until I found Kate and Julia‘s Lace Along. I e-mailed Kate, and I’m in! Thank you, Kate! Can’t wait to see the magazine, and the yarn is lovely. Lace weight, hunh. I think I’m quivering in fear, but I’m eager to see it as you go. Hi there! I tried to get that for you (instead of the trivets) but it had not been published yet!!! How is it? Is it a one time mag or will be a regular like the knitting one? I bought the magazine today. I can’t wait to start on the cute little top made with Paton’s Grace! I have to finish my Christmas presents first! I love the IK Crochet mag. I really want to make the Cranesbill top. It look like such a neat project. 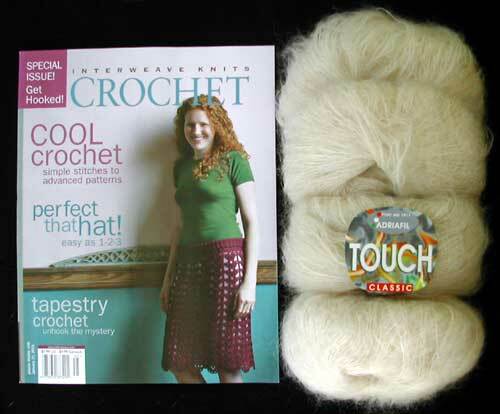 I ordered the IK Crochet magazine from Interweave and can’t wait to get it! What beautiful yarn for your shawl! I’m so jealous! I just went to my LYS and asked about that Interweave Crochet mag and they are so knitting oriented there they didn’t even know that there was such a thing let alone have it already! I want it bad!! Now I am truly green with envy !!! ooohhhh…that yarn looks heavenly! I can’t wait to see how it works up. I may have to track down that pattern though…I’ve been meaning to find a nice hairpin lace pattern. Thanks for the preview, Donna! Now I’ll just have to go track down that issue.